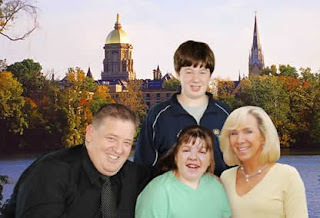 It was interesting to see someone besides Fighting Irish Thomas combine the weekend's two wildly divergent Notre Dame football stories concerning (former) Irish player Darrell Hand and Weis' special needs daughter, Hannah. Unfortunately, if not unexpectedly, the Chicago Sun Times totally botched the moral of the story proving there is a prime time place for FIT after all. It seems that Hand, a sparingly used sub on Weis' defense, was just kicked off the team for, according to Weis, "a violation of team rules." Of course, the vultures at the South Bend Tribune were more specific, saying that Darrell's indiscretion had something to do with asking a lady of the evening if she had the time. Meanwhile the Sun Times was crasser still. "Propositioning a prostitute a violation of Irish team rules? Well getting arrested for it is anyway." Yes, you Chicago rag writers, not only is it a violation of Irish rules, at Notre Dame it will get you kicked off the team for (at least) a season, not a game or a quarter, as it would at some of the teams Notre Dame plays—notably the one with the same nickname as a famous condom brand. Still, the worst thing about the Sun Times' article is that they combined the sick joke with a feature on Weis' developmentally delayed daughter, twelve-year-old Hannah. Weis, along with his wife Maura, Hannah and Charlie Jr., were breaking ground Saturday for their groundbreaking thirty acre South Bend facility dedicated to adults with their daughter's disability. "As a parent of a kid with special needs, your biggest fear is what will happen [to them] when you are gone," Weis said of the site which will include a recreation center, special needs housing, as well as a horseback riding farm. "This is a small way we're trying to help," said Charlie of the facility funded through both his own money and that raised by his non-profit organization, Hannah and Friends. "Because of Hannah," Weis continued, "there are going to be a lot of people with better lives." Obviously Charlie didn't need this bad publicity on this special weekend. But maybe Darrell did, especially the "better lives" part. Perhaps Mr. Hand needs a hand that only Hannah and her friends can lend. I don't know if those in charge of campus discipline would consider Hand working with the underprivileged a way Darrell could get back into the good graces of Our Lady and Her University, but I think it would be better if Darrell apologized not first to Weis, but to his daughter. Because, having worked with special needs children, looking into their eyes has a way of changing people, and on the Feast of the Transfiguration, this daughter may have a better chance of transforming the heart of the fallen Fighting Irish player than her famous father. We all know Weis' work is cut out for him this fall; with Quinn and Company gone to the NFL, ESPN's Mark May is predicting .500 "at best" for the Irish, and players already not on the same page as the head coach (let alone Our Lady) is not a good start. But little do they know that in Hannah, Weis has an ace in the hole, for her "cheers on high" are worth more than a hundred such chants from healthy fans. And the sooner the Tribune, Sun Times, Mr. Hand and Mr. May understand this, the quicker they will realize Notre Dame football is as special as ever. God bless the great school Notre Dame for giving thirty acres to this marvelous project. God bless the fine Charlie Weis and his talented staff for having such tight and moral standards. God bless Notre Dame's exciting teams and top-drawer students. God bless the wonderful Weis family for coaching Notre Dame. And, God bless the gracious and humble Hannah for being Hannah. There - the university, its football mentors, its teams and students, the Weis family and Hannah - five blessed wins on the board already. Pristinus, Thanks for your comments ... I'm sure Charlie would love them if he ever gets the time to read. Now if these five guaranteed wins were against Michigan, Penn St, Michigan St, Georgia Tech and Southern Cal and not Navy, Duke, Air Force, Stanford and UCLA, THAT would be something. 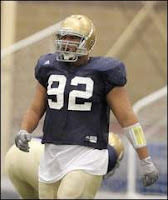 Since Hand will not be out for a season but rather evidently only for a few games, you will presumably want to retract the following statement and put ND in with the rest of the teams you demeaned: " Yes, you Chicago rag writers, not only is it a violation of Irish rules, at Notre Dame it will get you kicked off the team for (at least) a season, not a game or a quarter, as it would at some of the teams Notre Dame plays—notably the one with the same nickname as a famous condom brand." See the ND Observer article 8/19.